Surekha Amrut chalwadi, had lost her bag which had Gold ornaments worth 2 lakhs forty thousand and 20,000 cash on 14-03-2017. She could not realise where she lost the same while she was travelling from Belagavi to Kadoli village. On 22-03-2017, Prashant Fakirappa Kambli a resident of Kadoli who is an Auto driver of Tata Ace along with the owner of the vehicle came and returned the valuables to G Radhika, DCP Law and order. 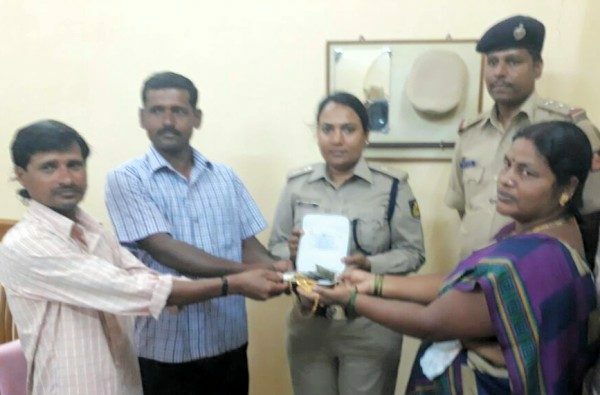 Seeing the honesty of the driver DCP Radhika honored Prashant Kambli for his honesty. Salute to his honesty.